“Out of the Depths” is a compelling book about a veteran of WW2. 89 year old retired Marine, Edgar Harrell, survived the 1945 sinking of the USS Indianapolis in the South Pacific. 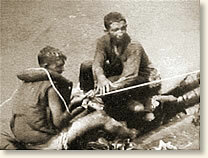 900 men immediately died in the Japanese torpedo attack, 300 more perished after 4 days afloat in shark infested waters. The 317 men who survived, did it by shear willpower, many testifying to God’s faithfulness throughout the ordeal which made these men heroes of character. As much as any nation in history, ours is rich with heroism. Thousands of our veterans have weathered rough deployments and come through with some of the deepest rooted values…faithfulness, bravery, and endurance. John F. Kennedy, George H.W. Bush, and John McCain are modern examples of public figures who endured hardships during war times. But thousands of compelling accounts come also from ordinary men and women who suffered days, months, and even years in conditions that seem to have been impossible to survive. This Memorial Day, while remembering the few and the brave, we must also realize that many of our current national leaders are the absolute opposite of “few and brave.” Far too many of them are faithless cowards, without the will to complete a difficult task or keep a simple promise. It’s good to hear our brave veteran’s stories, and encouraging that their families are pressing them to reveal the hardships they endured while in military service. Their accounts give us hope that we have not lost all character. Many good people are standing for values that count. Despite threats from the cowardly bullies in power, regular people are speaking up and working, even under threat of retaliation, to regain the “heroic” reputation this nation once possessed. This entry was posted in Uncategorized and tagged cowardice, Edgar Harrell, heroism, Memorial Day, Out of the Depths, USS Indianapolis, WW2. Bookmark the permalink.